Environmental education as a defined field of education has been practiced for many decades, but it is continually evolving. It evolves with our continued growth in understanding of the world around us, and also with the continued study of effective education practices. This fall season, Stanley Park Ecology Society has proudly facilitated professional development in this field, leading workshops as part of the 9th World Environmental Education Congress (WEEC) and the BCTF Provincial Specialist Associations’ Super Conference. WEEC attracted over one thousand educators, researchers, professors, activists, UN members and scientists from around the world who are all interested and invested in environmental education and issues. Keynote speakers included Jeannette Armstrong, Guujaw, Elizabeth May, David Suzuki, Dr. Tara Cullis and Wade Davis. Much of their shared talks centered on why we need a society that cares for the environment during a time when capitalist and consumerist societies have been influencing people in an opposite direction. 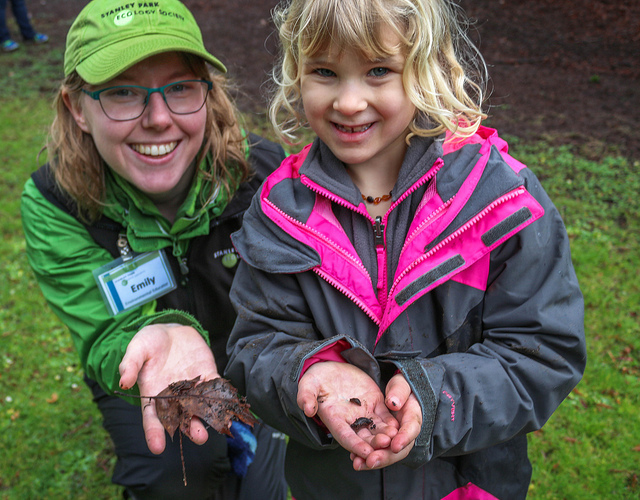 Stanley Park Ecology Society’s workshop took leaders in the academic field of environmental education into the forest within Stanley Park. We began the workshop by removing particular senses, and once in the forest, slowly reintroducing each sense with participants focusing their sensory experience on the diversity found within a 50cm2 section of the forest floor. Afterwards, as their vision expanded to the forest surrounding them, their perspective of the forest changed. 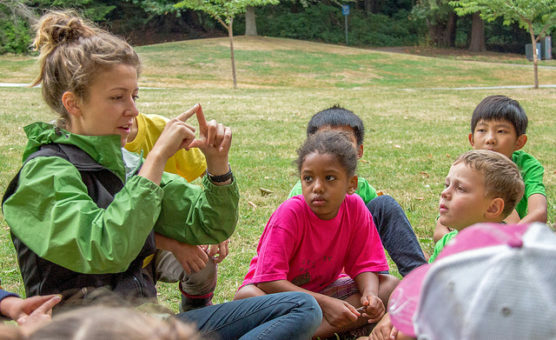 This activity was meant to symbolize how within a specialized field like place-based environmental education, focusing too closely on a particular direction can lead to an inability to see the bigger picture. We can also gain a deeper understanding of the big picture if we learn from each other’s experience. Facilitated discussions later delved into learning from each other, learning from “the whole forest” perspective, bringing up strategies for how we can keep sight of the big goal of creating an environmental ethic within our society. Clear evaluation strategies, collaboration techniques, and the reflection on how we never know what our lasting impact will be on program participants were all very enlightening directions of conversation. Since September, our School Programs department has led 5 professional development workshops: one as part of WEEC, two as part of BCTF’s PSA Super Conference, one for SFU student teachers, and one for a whole school of teachers in the Vancouver School District. We are happy to see the growth within this field of education, and to take a leadership role in the development that pushes this field to its greatest potential.